Recently, a good friend asked us to create placemats for his wedding luncheon. 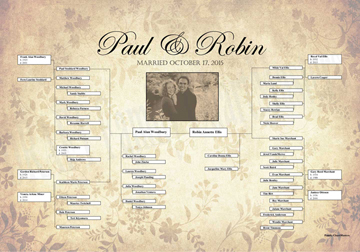 We put together a chart that showed how all of his family members were related to the new couple and designed it to match the wedding decorations and invitations. They turned out beautifully and I'm sure they were helpful to make sure that everyone new who was who at the party. It was a brilliant idea, and we were happy to be part of it. It reminded me of the table runner I created last thanksgiving. Copying an idea I had seen on pinterest, I put together many of my family's pictures and we printed the piece on vinyl so that it would hold up to lots of use. It brought a new level of meaning to our Thanksgiving table to sit and look at the faces of the people who brought us to where we are now. Any of our charts can be adjusted to create placemats or table decorations. We can print on vinyl, or laminate regular paper. You could even use our game cards to make a game out of it and see what your family knows about their family history. Really any kind of genealogy chart could work, such as examples from our gallery like this one, or this one or this one. I hope your family has a wonderful holiday season together. We'd be happy to create a table runner or some chart placemats or runners for you as well. And remember with any of our charts, after the first copy, any extra copies are 1/2 price. 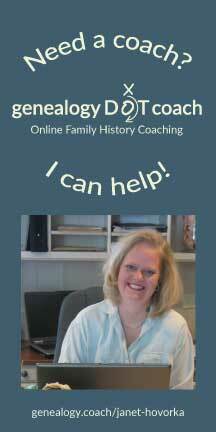 Just send your pictures and/or your genealogy information via our free consultation. 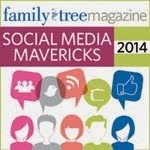 We REALLY CAN create any kind of family history art presentation for you. We love bringing your family memories front and center in your modern family to enrich and strengthen those around you now.